This pasta dish is best with a short, sturdy pasta such as tortiglioni or rigatoni. 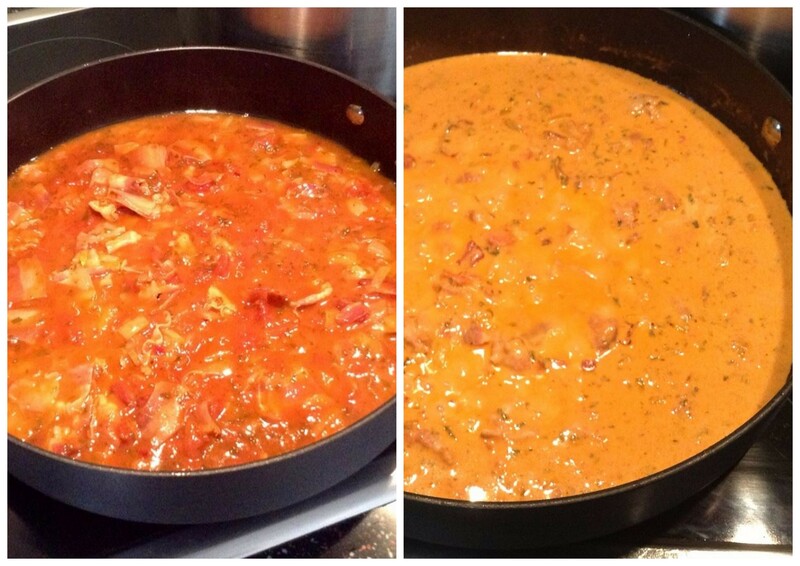 The pancetta and onions flambéed in vodka infuse the sauce with extra flavour. 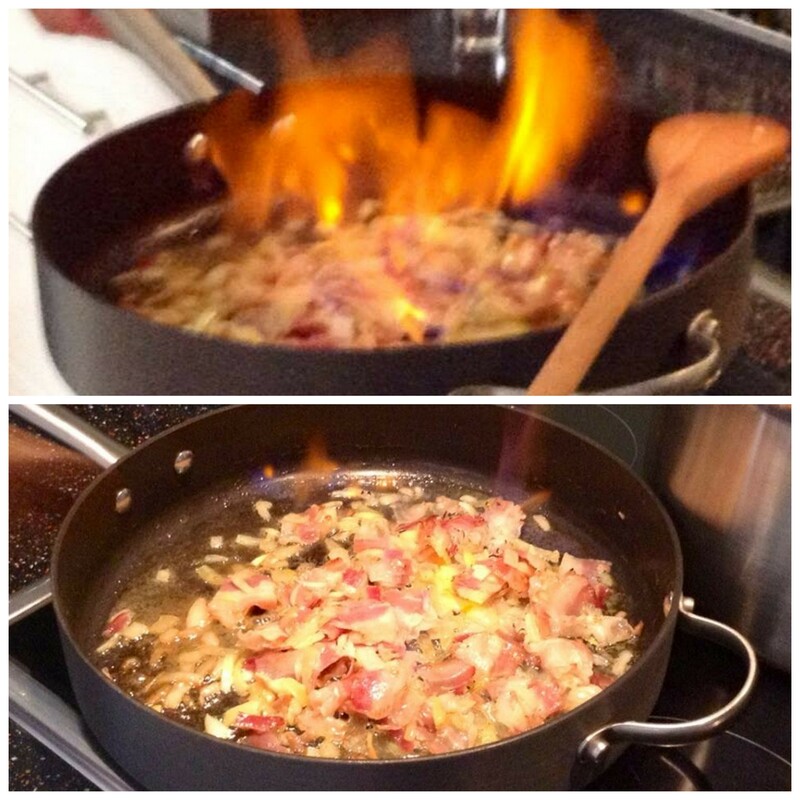 If you are a flambé novice, you will soon get over your fear as this recipe is easy to make. The creamy tomato sauce works well with some spicy heat and you are in total control of how much chilli you wish to add to the dish. Boil water for the tortiglioni in a large pot. 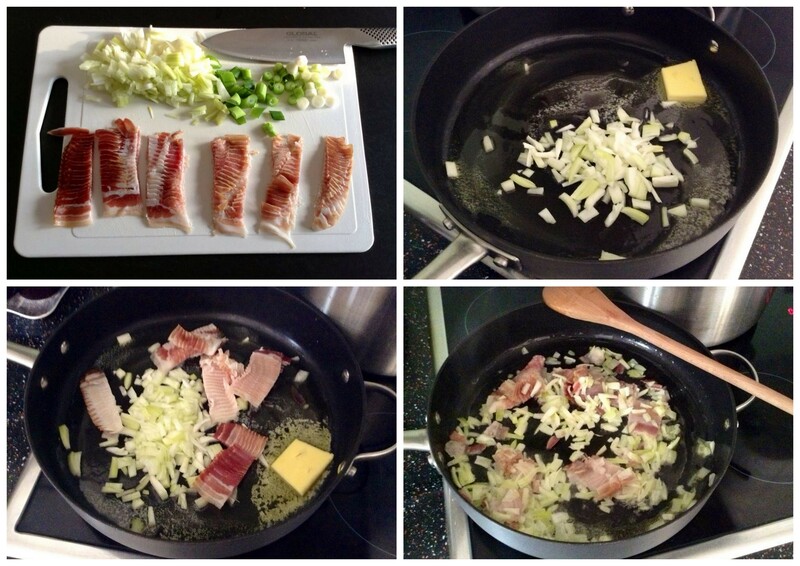 Slice 100g of pancetta (the one that looks like streaky bacon, not the cubed one), 1 medium onion and 4 spring onions. Put the spring onions aside for the end. While waiting for the water to boil, melt 2 tbsps butter in a large skillet. Add pancetta and onions and sauté over medium-high heat until the pancetta begins to crisp and the onions are translucent. Once the water is at a rolling boil, add 500g tortiglioni and cook as per package directions, but aim for the shorter cooking time so the pasta is al dente. 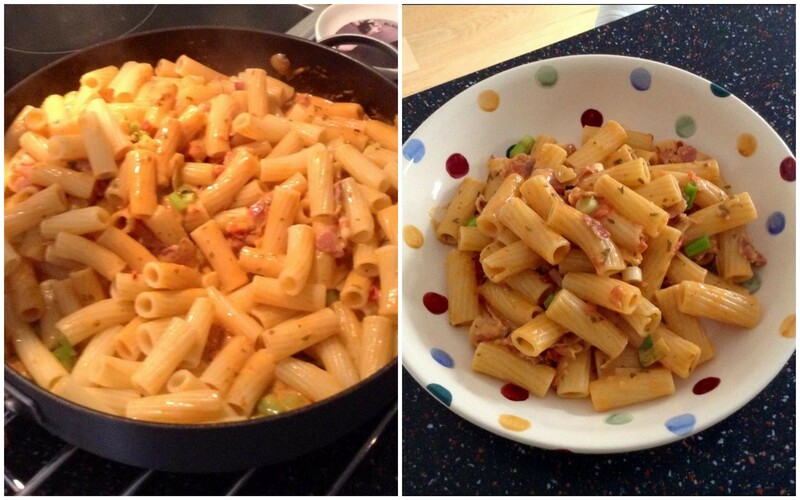 Add the pasta to the boiling water just before you are ready to flambé the pancetta and onions. Fill a shot glass with vodka and add it to the skillet with the sautéed ingredients. Wait a few seconds for the vodka to heat up, in order to release the vapours. This may create a flame on its own but if you want to create a burst of flame, carefully ignite a utility lighter over the sauce (I find a utility lighter easier and safer to use than a match). Briefly remove the skillet and its flame away from the burner (and your face!) until the flame subsides (it will, within seconds). If flambéing still makes you nervous, just carefully add the vodka to the skillet and give the ingredients a stir. Stir in half a cup chicken stock, 1-½ cups tomato sauce and 3/4 cup double cream (for a lower fat version, you can use Elmlea’s double light cream alternative; it works just as well). This is where you add as much chilli as you like. The easiest way is to buy ready-made tomato sauce with chilli already added. Other options are adding a pinch of dried crushed chillies or finely chopping as much fresh red chilli pepper as you like (the bird’s eye ones are spicier). Season with salt and freshly ground black pepper. Simmer the sauce until it is reduced to medium-thick consistency, about 6-8 minutes. Add the spring onions at the very end. These add extra flavour and texture. Drain the pasta once it is cooked al dente. Add the tortiglioni to the sauce in the skillet. 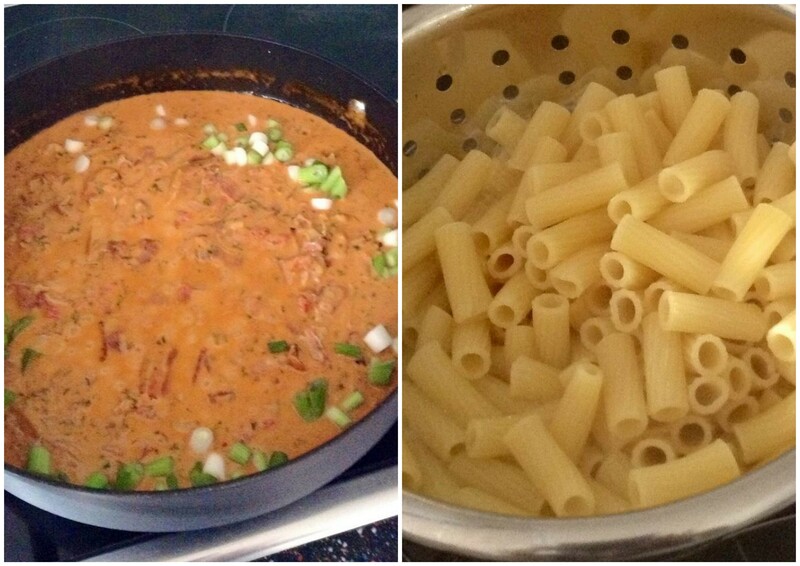 Toss pasta and rosé sauce over medium heat until the sauce coats the tortiglioni, about 30 seconds. Serve immediately. Makes 4 servings. Enjoy! 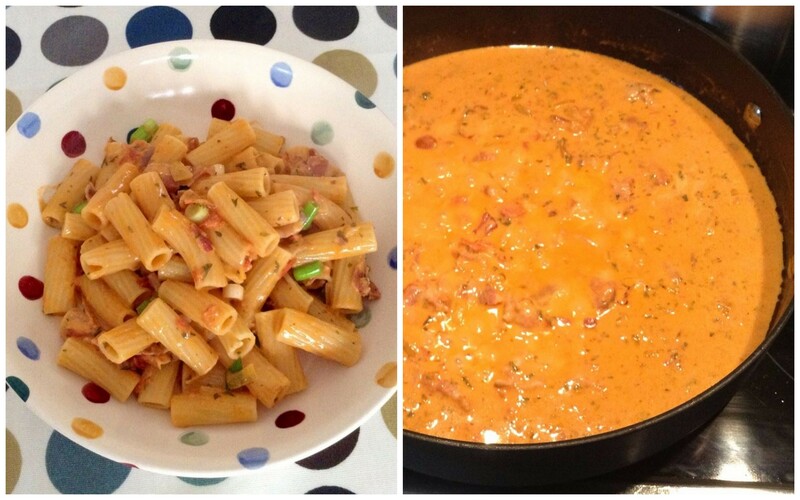 This entry was posted in Our Kitchen and tagged alla vodka, chilli, cream, flambé, onions, pancetta, rigatoni, rosé sauce, tomato sauce, tortiglioni, vodka by One Two Culinary Stew. Bookmark the permalink.